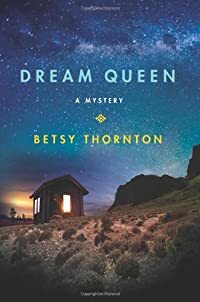 Dream Queen by Betsy Thornton, a Mysterious Review. Review: Set in the 1990s, Betsy Thornton introduces how Chloe Newcombe, a private investigator in New York for a financial services firm, came to be a victims' advocate in Arizona in a prequel, Dream Queen, the sixth mystery in this series. Following the death of her brother, James, of AIDS, Chloe left California for a new life in New York City. Now, two years later, Chloe's other brother, Danny, who lives in a small town in Arizona, asks her to meet his new girlfriend, Kristi. She agrees, in part because James' lover, Hal, with whom she bonded while James was dying, has set up a practice in nearby Tucson to work with AIDS victims and their loved ones. Flying to Arizona, Danny and Kristi meet Chloe at the airport, but on their way home Danny's van stalls at a traffic light. A service station is nearby, and while Danny waits to have a new battery installed, Chloe and Kristi walk across the street to a restaurant. When a hour passes and Danny hadn't joined them, they return to the service station only to be told Danny walked off, leaving his wallet on the seat of the van. With little they can do there — Danny hasn't been missing long enough to interest the police — they return to Danny's home. The next morning, Chloe awakes to find that not only has Danny not returned, but now Kristi is missing. She gets in touch with Hal, who agrees to help search for them, but warns her that Kristi — and possibly even her brother Danny — may be involved with "Dream Queen," a new street drug. Chloe's search for the truth takes her from Tucson to Los Angeles and back, uncovering hidden truths about her brothers, their lovers, and even herself. Dream Queen is a riveting, multi-layered mystery. Both the primary and secondary characters are finely drawn and uniquely developed within the context of the intricately crafted, yet fast moving plot. The conclusion comes as a surprise and is completely unpredictable. Readers will almost certainly want to know more about Chloe's life in Arizona subsequent to the events presented here by seeking out the earlier books in the series. Special thanks to guest reviewer Betty of The Betz Review for contributing her review of Dream Queen. Acknowledgment: Minotaur Books provided a copy of Dream Queen for this review.